(CNN) -- Former Ferrari technical guru Ross Brawn, whose Brawn GP cars are setting the pace in this year's Formula One championship, is warning that the sport will suffer if his old team carries carries out their threat to quit next season. Ross Brawn wants a compromise to be reached in F1 budget gap row. Ferrari and other leading teams are involved in a stand-off with F1 chiefs and motorsport's world governing body Federation Internationale de ''Automobile (FIA) over a proposed $60 million budget cap for the 2010 season. 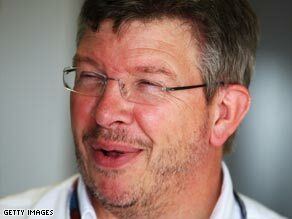 Negotiations have failed to find a compromise and in an exclusive interview Brawn told CNN of his concerns. "I don't think it's great for the sport; I don't think it's great for Ferrari," he said. But Brawn said his former employers had to face up to the reality of the global downturn and its impact on the previous money no object world of Formula One. "You just have to have a slightly different mindset, and I think the world's like that now, we're going through a difficult economic period, and I think you can still get the things you want out of Formula One for less investment. "I think Ferrari just need to be helped through that phase and understand how they can get all the thing they want out of F1 for a lot less money than perhaps they're used to spending in the past." Brawn said that crisis talks held last Friday were "reasonably productive" and that further meetings were planned at this week's Monaco Grand Prix. "We need to find ways of making it viable for new teams to come in to F1, maybe not winning races, but looking respectable, and filling those empty grid spots," he added. Brawn's comments came as reigning Formula One champion Lewis Hamilton also told CNN in an exclusive interview that the loss of big teams such as Ferrari would damage the prestige of the sport. "Formula One would not be what it is today without the key players -- without McLaren, Ferrari, Renault -- without these key manufacturers there. So it will be interesting to see what happens over the next couple of months," said Hamilton. Team principal Brawn and partner Nick Fry set up their new team in a management buy out after Honda pulled out of F1 at the end of 2008. "We really didn't know if this team was going to survive so to have survived and then come out the other side with the results we're getting now is just fantastic," he said. Brawn GP's drivers Jenson Button and Rubens Barrichello occupy the first two places in the world championship heading into the Monaco GP with Button winning four of the five rounds. "He (Button) has been driving fantastically well this year, some great overtaking maneuvers, and some great laps, which have not always been quite so apparent but certain times in a race we've said to him "you need to produce a lap time now to make the strategy work to make the race yours" and he's done it," he added. Qualifying for the Monaco GP takes place on Saturday ahead of Sunday's race proper in the principality where Brawn will be looking to underline their dominance.